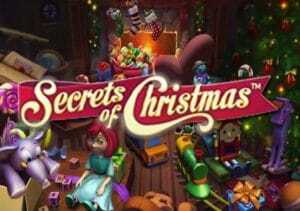 Secrets of Christmas is a Net Entertainment video slot with 5 reels and 25 paylines. Playable from 25p to £125 a spin across desktop, mobile and tablet devices, this Christmas themed offering gets you into the festive spirit at your favourite time of the year. Set in a wooden and cosy lodge, the reels are decorated with festive holly. You will see bells, toys, gingerbread houses, milk and cookies (for Santa) and Santa Claus himself. There are also lower value playing cards which are holly styled and have twinkle lights within them. The most valuable symbol, the bell, rewards you with 50 times your stake for 5 in combination. Santa Claus is the wild symbol and replaces all symbols bar the scatter – he can also appear on all reels. The soundtrack is particular cheerful as you would expect. There’s a Free Spins feature which is played when you get 3 more scatters, the sackful of toys, anywhere in view – this will reward you with 10 free spins. Now, you get to pick from Christmas gifts before the feature commences – the more scatters you get, the more picks you’ll receive. Here, you can win extra free spins (up to 10), 1x or 2x multipliers, extra candle and/or bell wilds and wild reels which appear on reels 2 and/or 4 on each free spin! What you would hope for is to uncover 5 and 10 free spins (taking your total to 25), 2 wild reels and the 2x multiplier. Or, you could get 2 wild reels, 2 extra wild symbols and a 2x multiplier. If you get the 2 multipliers on offer, you will receive a 4x multiplier altogether! Secrets of Christmas is all about the Free Spins feature and is a medium variance game with wins of up to 1,425 times your bet available to be won in the feature. Hopefully, Santa can reward you all year round. I also recommend you try NetEnt’s Warlords: Crystals of Power which is just superb.